For centuries the Mekong has provided inland transportation for people, and merchandise for millions living along its banks, and tributaries. This mother of all rivers flows through six countries in the heart of Southeast Asia and forms part of the international border between Myanmar (Burma) and Laos. Myanmar, is on the threshold of great change. In recent years, the world has revered the courage and dignity of Aung San Suu Kyi, the Burmese woman who wishes to blend the best of the past with the progressive tones of modernity. Visually Myanmar is a gem. In no other land is the eye so constantly delighted by scenes of casual, almost unintended beauty. Myanmar is an agrarian society, and from the anonymous vantage point of a train compartment, travelers can absorb the essence of this country: a background of soft browns, wooden ploughs following patient oxen across fields, the dazzling green paddies, noble tamarind trees and above all pagodas strewn like jewels across hills and fields. Myanmar's chief beauty, however, lies in her people, who exude style, grace and vivacity. The majority of both men and women wear the traditional longyi (sarong) with blouse or shirt; the jet-black hair of the women is often adorned with fresh flowers. Patterns of fragrant Thanaka, powdered bark, add a finishing touch any personal toilette. The Garden City of the East Upon exiting the spacious new airport of Yangon (formerly known as Rangoon), travelers tussle with tangled traffic to reach the capital just minutes away. Fortunately, the few modest high-rise buildings never interfere with Yangon's handsome style. Rebuilt on the grid system in the 1850s, with wide tree-lined boulevards bordered by fine stone buildings, Yangon was the 'Queen of the East'. Today the city is under renovation. The watchful eye of conservationists ensures that developers preserve the city's architectural heritage. The old sits comfortably beside the new. Travelers also like to saunter through Bogyoke (Scotts) Market with its gem shops. 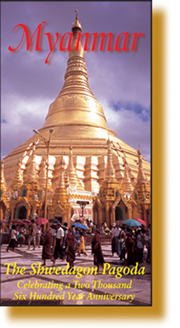 The majestic golden spire of the Shwedagon Pagoda in Yangon, with its aura of legend and history, stands resplendent for its 2,600 anniversary in 2012. Standing 99 metres high, covered with 60 tons of pure gold and surrounded by 64 stupas, a visit to Myanmar is incomplete without seeing the most ancient historical Pagoda in the world. The gem city of Mandalay, a former capital, is also a land of legend. Upstream from Yangon, the river glides beneath "the gilded spires of Mandalay and the pagoda sprinkled heights of Sagaing". Little remains except the crenellated outer brick wall and a 70-metre wide moat where, 140 years ago, royal barges glided through the lotus-laden waters. The majority of monks in the country reside in and around the Mandalay area. Stone carvings of Buddha statues, embroidery, a silk weaving factory and gold leaf working sites are cultural drawcards. On a bend of the Ayeyawady River (Irrawaddy) sits Bagan - one of the three most famous Buddhist archaeological sites (11th-13th century) in the world - 300 kilometers downstream from Mandalay. Once a capital of Myanmar and of the whole Buddhist world, this plain is thickly studded with over 2000 pagodas and temples; their magnificence a testament to Bagan's former greatness. The sunrise and sunset views are breathtaking. Whether travelers journey by train or boat, this enchanting country offers many quaint if not eccentric cultural quests. As supermarkets are built alongside street stalls and Internet services enter daily life, Myanmar's timelessness may well protect each future generation as the veil of Buddhism rests deeply around Myanmar's soul. While Myanmar is a country rich in natural resources but needy in infrastructure - a country in transition - its magic will prevail as even the colors and contours of the countryside conform to the ideals of Buddha's Middle Way.